The Premier League is back and SoccerNation is bringing it home. The buzz of the world’s most popular league is certainly palpable in and around America’s Finest City, San Diego, California. Powered by soccerloco, SoccerNation is spotlighting the supporters groups that fill local pubs to capacity, sing with unbridled passion, and create matchday atmospheres that should be the envy of most of any fan. 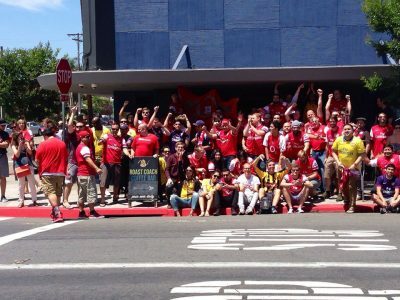 Kicking things off, our first Premier League Supporters Group Spotlight shines down on the San Diego Gooners, SD’s loyal lovers of the Arsenal. I joined the Gooners at their main locale, Bluefoot Bar & Lounge in North Park, for the season opener against Leicester City. It was an enthralling first page of the 2017/18 Premier League story. Two goals from perennial party having speedster Jamie Vardy and one from Shinji Okazaki weren’t enough for the Foxes as Arsene Wenger’s men engineered a stirring comeback, capped off by substitute Olivier Giroud’s late headed winner, giving Arsenal a memorable 4-3 victory at the Emirates Stadium. From North Park to North London, Gooners everywhere were in high spirits this weekend. How long the high will last is anyone’s guess, but in fine times and crap times you’ll find the San Diego Gooners hanging at Bluefoot for every match, embracing the good, the bad, and the ugly of the club they hold dear. I chatted with dozens of wonderful people through the course of a wild afternoon. 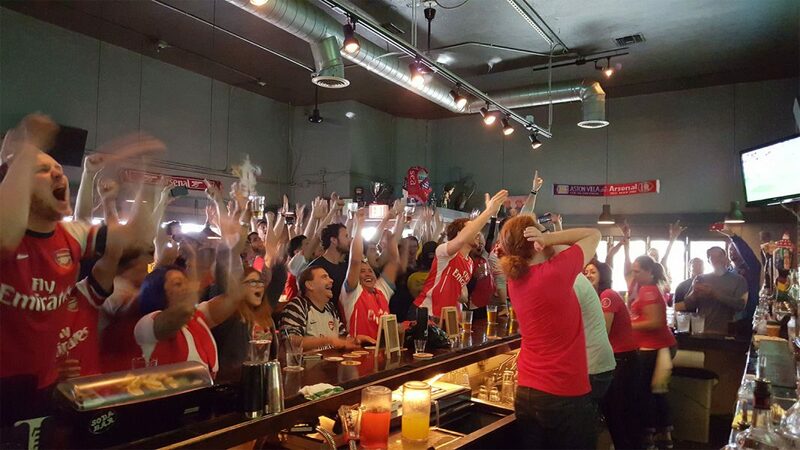 There were close to 100 Arsenal fans inside the bar for the opening-day showdown with Leicester. One of the more impassioned conversations took place between yours truly and one of the original founders of SD Gooners, Luis Corales. We spoke about the roots of this particular supporters group, took some quality trips down Arsenal memory lane, and fell to the floor with stories of the infamous FA Cup Final celebrations of 2014. Nate Abaurrea (SoccerNation): Luis, how did the San Diego Gooners get their start? Luis Corales (SD Gooners): Myself and two good friends started the group back in 2009. In 2012, we got official recognition from the club and Arsenal America. This was massive for us, being honored and accepted by the club that we love. We’ve got close to 500 members, and we’re always packing the bar on matchdays. Nate Abaurrea (SoccerNation): Why the Bluefoot? Luis Corales (SD Gooners): For years, we used to meet up at Shakespeare’s. We had some great times there. Naturally, as Premier League fandom was rising rapidly, Shakespeare’s became a lot more populated with other groups wanting to watch their teams. There was definitely some competition for TV’s and that type of thing. We started thinking about other options around the time we got in with Arsenal America. We knew we needed our own place. Then one day we met this guy named Dirk. He’s like, ‘hey, I’m an Arsenal fan, and I work at this really cool bar in North Park owned by a guy who wants to start showing more soccer’. We decided to give it a shot. It was perfect timing really with the way North Park was on the up and up as a neighborhood in San Diego. Before too long, we just fell in love with the Bluefoot. And to be able to stumble out at halftime or at the end of a match and have a handful of delicious food options waiting within a block of you is pretty damn nice. Dirk Dawson (SD Gooners): It was funny because I was thinking of starting up an official Arsenal America group here in San Diego. Then I happened to run into Luis and his friends around 2012. When they told me they already had a group going, I was like, perfect; I don’t have to run the damn thing! I told them to come on over to Bluefoot. We’d make it like a clubhouse for Gooners. Nate Abaurrea (SoccerNation): How were you connected with Bluefoot in the first place? Dirk Dawson (SD Gooners): We had started coming down here for games around 2009, just me and a handful of friends. We knew a guy who worked here and, no joke, he would work the night prior, help close the bar, then sleep on the pool table to make sure he was here to open the door when we came knocking, usually around 6:30 AM. After a while he just looked at me and was like, why don’t you get a job here? I hadn’t tended bar since I was in college, a long time ago, but I thought, hey, early in the morning, Bloody Marys and beer… can’t be too hard, right? We spoke with the owners and I was offered a morning bartending job. 8 years later, I’m still here working 3-4 shifts a week. Nate Abaurrea (SoccerNation): I know you’ve been an Arsenal fan for longer than your tenure behind the bar. Before Bluefoot, where were you watching matches? Dirk Dawson (SD Gooners): Oh man. Well of course there were the various couches and living rooms around San Diego. One of my favorites was back around 06/07. There was this Vietnamese Coffee Shop on 54th and El Cajon where we were watching matches for a while. They opened up at 6 AM on the weekends and somehow they had the channels some of us didn’t have at our houses, the old Fox Soccer, Setanta Sports, and such. The guys there were super cool and let us come in and have our little corner. We’d sit with a few cab drivers getting ready for their shifts, watch the games on a little TV, a little hyperactive as we’d be drinking what I still consider the strongest coffee ever. I’ll never forget those times. It’s funny to think back on. It was all about dedication to the Arsenal. Luis Corales (SD Gooners): We cherish this place. We know it’s ours. One of the things I love most is meeting new people here on any given matchday, people from all over the country and all over the world. They’ll speak to Arsenal America and then they’ll be guided to us. If a passionate Arsenal fan for some reason finds his or herself in San Diego, they come here. That’s pretty freaken special. But I also love the regulars, seeing the same people here game after game, regardless of the results. All these people are going through the same thing as me, whether we’re scoring sensational goals or our backline is crumbling in front of us. We’ve also had tons of expats come here from London, childhood Arsenal fans. Hearing them say how much the atmosphere inside Bluefoot reminds them of pubs and bars back home, from the songs and drinks to the focus and the overall passion, it means a lot. Bluefoot is a home away from home for us. We love it here, and we’re always grateful to know it’s ours. Marisa Cali (SD Gooners): I love the San Diego Gooners because of that special camaraderie. 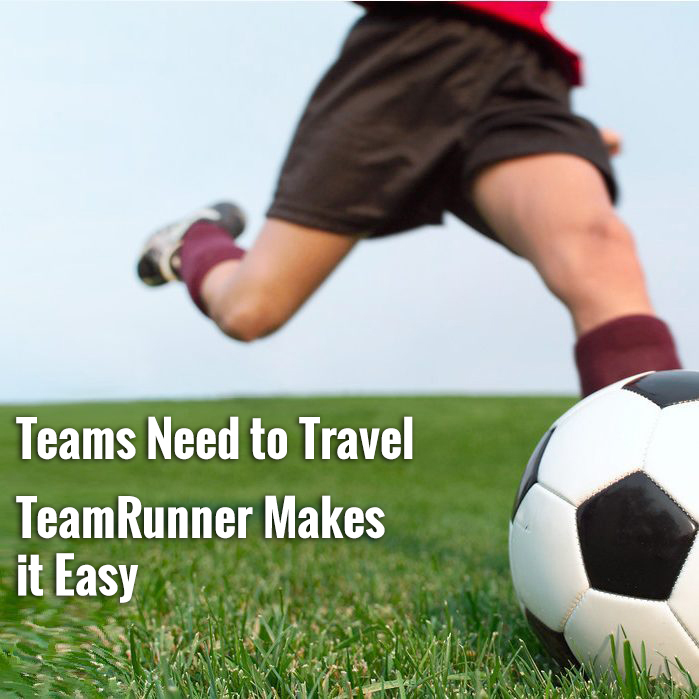 There are so many different people involved with this group, people who come from different cultures, support different national soccer teams or American sports teams, and people who lead very different lives. All those differences disappear when we’re at Bluefoot and Arsenal take the pitch. Every time I go for a match, I see familiar faces and meet someone new. The badge brings us all together. It’s an awesome feeling. Luis Corales (SD Gooners): I’ve never been more scared in my adult life. It was an insane game, infuriating at times. When Ramsey scored the winner in extra-time, I lost it and started jumping up in the air. There was probably a good inch of beer on the ground and when I came down, I shot straight back up in the air, but not in the right direction. I slipped and fell straight on my back. I looked up and all I could see was the bottoms of feet. I just covered up my face, thinking ‘oh god, I’m gonna get stomped by my own people’. Then out of nowhere, this random arm just reaches down, grabs me by the forearm and flings me back to my feet. I was saved! There have been some great times here with this group. For me, it’s hard to top that moment. Pretty much exemplified the camaraderie. If interested in joining up with the San Diego Gooners, check out their Facebook page, www.facebook.com/groups/Sdgooners, follow them on Twitter @SanDiegoGooners, or swing by Bluefoot Bar & Lounge at 3404 30th St and enjoy a match with San Diego’s official Arsenal Supporters’ Group. Hailing from Watsonville, California, Nate Abaurrea is a writer and broadcaster specializing in coverage of the beautiful game on both sides of the USA-Mexico border. In addition to the #SNPod, Abaurrea's voice can be heard calling Liga MX matches in English for Club Tijuana, USL-PDL action with So Cal Surf, and the MASL with the San Diego Sockers. He also loves wine. And tacos.